Servo press directly (or via gear drive) drives pressing mechanism in utilization of the power,speed change and execution and many other functions and the characteristic of good rotation speed controllability of low-speed large-torque direct driven servo motor, uses self-adaptation torque control technology and computer control technology, and utilizes digital technology (and feedback control technology) to control the operation of servo motor; can accurately control the location of sliding block relative to the motor rotation angle so as to independently control the location and speed of sliding block, uses a kind of pressing mechanism to the most suitable sliding block movement mode set for several pressing technology, and realizes all kinds of sliding block movement curves required by the technology via the preparation of different procedures to obtain the deformation speed of different workpieces; guarantees the quality of workpieces, improves the service life of moulds and is a kind of environmental protection and energy conservation press which achieves digital control of mechanical press and makes the mechanical press enter digital age. ■ Improve the production rate with stroke length able to be set as the minimum value necessary for production and maintain the forming speed matching with the processing content. ■ Make the product precision higher and always guarantee the precision of bottom dead center via closed loop feedback control. Restrain deckle edge of product and prevent defective products. ■ Have low noise and long mould life and greatly reduce noise via low noise mode (namely the reduction of contact speed between sliding block and plate materials) in comparison with mechanical press. The mould has small vibration and long service life. ■ Sliding block movement is of controllability, the user can utilize this characteristic to prepare sliding block movement mode suitable for the processing technology to effectively improve the precision and stability of product, improve mould life and the production rate, and be able to achieve mute blanking and even be able to expand processing scope (such as pressing processing of magnesium alloy etc.). It applies to blanking, drawing, coining, bending and other technologies and the characteristic curve of different materials. For example, the sliding block operation can be stopped to maintain the pressure and its purpose is to improve the forming quality of the workpieces. ■ It is of energy conservation and environmental protection and flywheel, clutch and other energy consuming elements of traditional mechanical press are cancelled, resulting in the reduction of actuator and the simplification of mechanical drive mechanism; lubricating oil quantity is small and the stroke can be controlled; due to the small power consumption, operation cost greatly decreases. 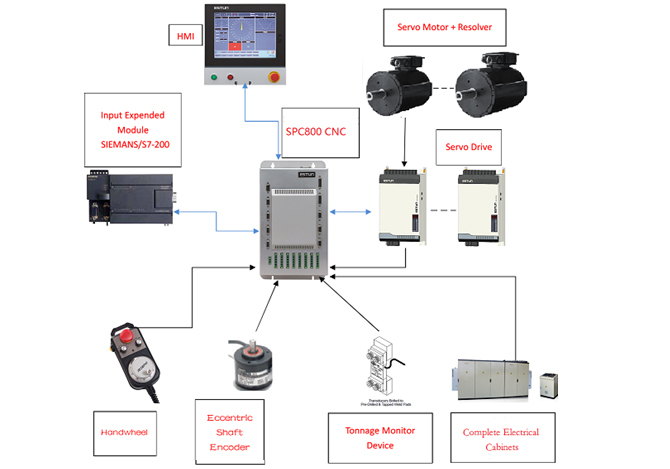 ESTUN automation provides complete automatic control solution for servo press, including dedicated control system, large-torque heavy-load AC servo driver and permanent magnet synchronous servo motor, complete set of electric control cabinet etc. 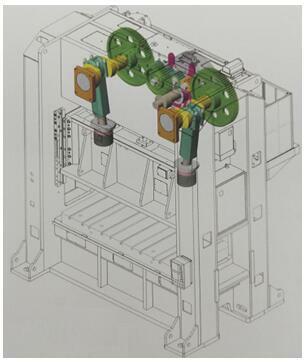 ■ Direct driven low-speed large-torque servo system is used, servo motors of EMT series from 35kw to 100kw apply to different types of servo presses such as crank type, toggle type and the like and are equipped with a variety of international certifications such as CE, UL and the like. ■ Digital control device of dedicated servo press has flexible setting function of operation curve trajectory control and 7 built-in processing curves of system with each processing curve automatically judging and displaying the setting parameters required to facilitate the use of the customers. ■ Statistical function of power is provided to facilitate the user’s real-time master of machine tool energy consumption. ■ Motor monitoring, braking detection, tonnage monitoring, lubrication control, overload oil fill and other functions can effectively protect the machine tool. ■ Protective treatment, warning information display and storage functions are provided for the illegal operation of user to facilitate the machine tool maintenance of user. ■ Professional and complete set of electrical cabinet has the design and manufacture capacity of energy storage capacitance cabinet.